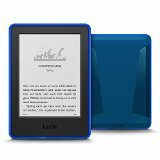 Kindle, 6″ Touchscreen with Wi-Fi – Includes Special Offers – This is the basic, entry level model Kindle. The touch screen is E Ink Pearl™, 167 ppi resolution with a 16-level gray scale. Four GB onboard storage.There is no built in light. Normally $79, the device is on sale for $59. Kindle Paperwhite, 6″ with Built-in Light, Wi-Fi and Special Offers – The Paperwhite has a built in light, a high resolution 300 ppi display, exclusive Bookerly font and 16-level gray scale. Four GB onboard storage.Normally $119, the ereader is on sale for $99. Kindle for Kids Bundle with the latest Kindle, Accident Protection, and Kid-Friendly Cover – This bundle includes the latest basic Kindle , 2 year accident protection warranty and a special kid-friendly case in your choice of Black,Blue, Green, Pink or Purple. Four GB onboard storage. There are NO sponsored screensavers on this model, making it a great buy for adults as well as children. Normally $99, the bundle is on sale for $79. This is a good time to buy for Holiday gifts.